Although the White Star Line is most famous for building the Titanic, it also commissioned another ill-starred ocean liner several years earlier. Built in the same shipyard in Belfast, Ireland that later worked on the Titanic, the SS Laurentic took her maiden voyage in 1909. While smaller than her more famous sister ship, the Laurentic was one of the largest steamships built for Canadian transport at the time. She measured 550 feet long with a 67-foot beam width. Powered by two engines and three propellers, she was also one of the swifter ships in operation during that time period. Designed to carry over 1600 passengers, the SS Laurentic initially operated as a ocean liner traveling between Liverpool and Montreal. In her first five years of operation, she transported thousands of British citizens emigrating to Canada. 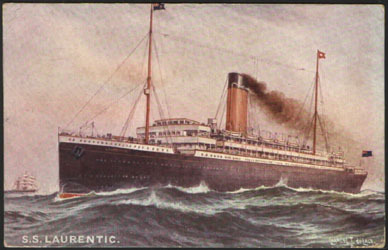 The Laurentic also gained fame in 1910 as the ship that carried Scotland Yard Inspector Walter Dew to Canada as he pursued – and later captured – the notorious murderer Dr. Crippen. In fact, the Laurentic’s phenomenal speed capabilities were showcased in this incident. 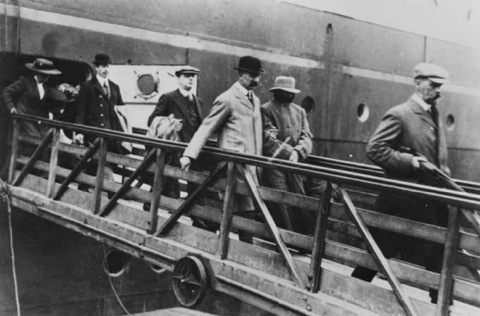 Trying to elude capture in England, Crippen fled to Antwerp where he boarded the liner Montrose bound for Canada. Inspector Dew followed his quarry by setting sail on the Laurentic which was known to be a much faster ship. The Laurentic arrived in Canada two days before the Montrose docked. When the Montrose did arrive -- with Crippen onboard -- Inspector Dew was waiting for him. 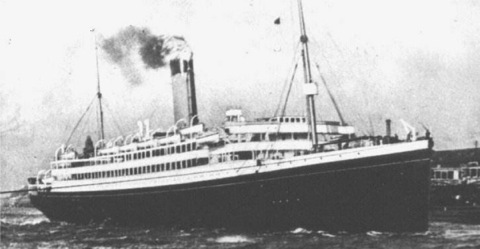 Once war broke out in 1914, the government drafted the Laurentic into government service, whereupon she transported Canadian troops to Europe and German prisoners from West Africa. In 1915, the Laurentic was assigned to the Far East and the Indian Ocean where she operated as a fully armed merchant cruiser. Since her engines made her faster than a submarine, she was especially well-suited for this assignment. By 1917, the Laurentic had returned to northern Europe. She was due to set sail from her old port of Liverpool in January of that year. But this time, she would be carrying more than just passengers and crew. Her cargo included over 3000 ingots of gold, forty-three tons worth. This gold bullion was intended to pay for munitions that were desperately needed by the British to defeat the Germans. The bullion was valued at 5 million pounds in 1917; today it would be worth more than $3 billion. But it wasn’t just the men who were lost to the sea that night. So too were the 3211 ingots of gold. The British Navy made numerous attempts to retrieve the treasure. More than 5000 dives were undertaken between 1917-1932, resulting in most of the gold being recovered. 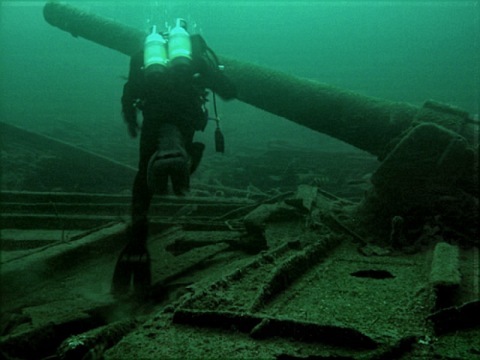 For decades, many divers tried to gain access to the shipwreck, but the Ministry of Defense owned the site until 1969 when the Cossum family acquired salvage rights. Various diving companies recently received permission from the Cossum family to allow divers to legally explore the sunken Laurentic. Indeed many artifacts have been retrieved from the site since 1917, and salvage efforts between 1917-1924 resulted in the greatest recovery of gold from a sunken ship ever recorded. But as divers around the world know all too well, twenty gold bars worth 10 million pounds are still waiting to be found at the bottom of the Irish Sea.